All the tips and tricks needed to shape up for 2009. Each day brings new, expert advice on how to look your best and live life to the fullest, while having a little fun doing it. We asked Tim Little, the shoe designer and creative director for the 140-year-old British brand Grenson, for the five shoes every man should have in his closet. "It's a bit like choosing my five favorite songs," says the cobbler. He, of course, recommends buying quality but offers up an old army saying to back it up: "Always spend good money on your shoes and your bed, because if you're not in one you're in the other." First, it has to be chunky which means a big sole and nice wide round toe. These shoes are made to make you feel that you can conquer the world so they have to have real substance. It should have a chunky welt which extends from the shoe as you look down at your feet. Look for a full wing tip, don't be fooled into thinking a straight toe cap will do. The trick is to polish them with a darker color like dark brown or even black for a lived-in look that can be worn with anything from a gray suit to a pair of beaten up jeans. The story goes that Nathan Clark invented this boot in 1950 after seeing something like it Cairo. It's classic, practical and comfortable to boot (sorry). As with the brogue there are many versions but there are also rules. Although they can look wonderful in smooth calf leather, the true Desert boot is always in suede. Don't be tempted by fancy stitching or punch detail of any sort, this shoe is design at its simplest and that's its charm. The sole is, of course, what makes it. It has to be crepe. We all need a sharp pair of black shoes for meetings and going to funerals. 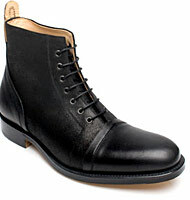 Black, it seems, has diminished in recent times from an everyday color to a more special event color in men's footwear. The wholecut is a shoe made from a single piece of leather and has no seams on the upper at all. It's sleek and elegant and does what a black shoe is supposed to—look smart and serious. Black shoes close the deals, never try doing an important deal in brown leather or suede. Start with the eyelets. I think that eight is about right. Six eyelets and the boot's a little short, 10 and you'll look like an English soccer hooligan. The leather needs to be rugged. Obviously, they're more likely to be worn for the long trek downtown than in the wild, but the leather and the sole should be really tough. For me, the Commando sole definitely does the job. You'll leave clumps of mud all over the house but an explorer like yourself doesn't worry about such things. It may seem strange for an Englishman to recommend sneakers but every man should have a few pairs and I have about thirty. Look for classics like the adidas Gazelle or the simple Converse All Stars. The sole should be the white walled, which is a bit more casual and loungy. I'm not comfortable with the running shoe sole unless I'm running, which isn't very often. Tim Little has had tours of duty at Dunhill and Tod's.